Since the historic win of Donald Trump, the American media and pundits have been grappling to understand the election results and their inability to predict the turn of events. It will take some time before detailed data on actual voter behavior is made available but one trend is clear. Voters who live in large urban centers, largely voted for Hillary Clinton while those who live in more rural parts of the country voted for Donald Trump. The ideological divide manifested itself through the vast geography of the United States. The reasons are linked to the inequities that define today's America and how its citizenry is divided along class lines. The residents of cities are typically wealthier, have higher educational attainment and are somewhat more liberally inclined. Conversely, many rural parts of the U.S. are poorer and are less educated in the formal sense. These generalizations admittedly are challenged by many exceptions but the electoral maps attest that the blue (Democratic) clusters are in cities and the Republican support is strongest in the vast lands of rural America. Most states where one party controls both branches of the legislature (State House & Senate) are gerrymandered in the ruling parties favor. The 2016 presidential election county-by-county map shows that the urban rural divide has been further intensified by gerrymandering. When districts are drawn to shepherd Democrats and Republicans into their own corners (in different parts of a state), this makes the disparities in their voting patterns even more vibrant and obvious on an electoral map. Instead of a balance of conservatives and liberals, a mix of red and blue spread out across a state, gerrymandering essentially segregates and silos D's and R's into their own subsections as you'll see below. 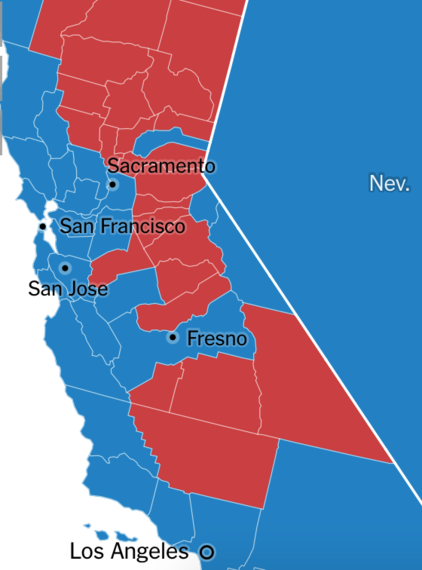 All along the 'lefty liberal', designated Democrat west coast, there were large swathes of red. Half of California, the supposed holy grail of the Democratic party west of the Mississippi, voted for Trump. The counties that went blue were invariably clustered around the urban centers of Sacramento, San Francisco, LA and San Diego. Further up in Oregon and Washington, the blue zones were not surprisingly concentrated around the large metropolises of Portland and Seattle respectfully. Outside of the city centers, the rural populace of two northwest states - Oregon and Washington - voted for Trump. 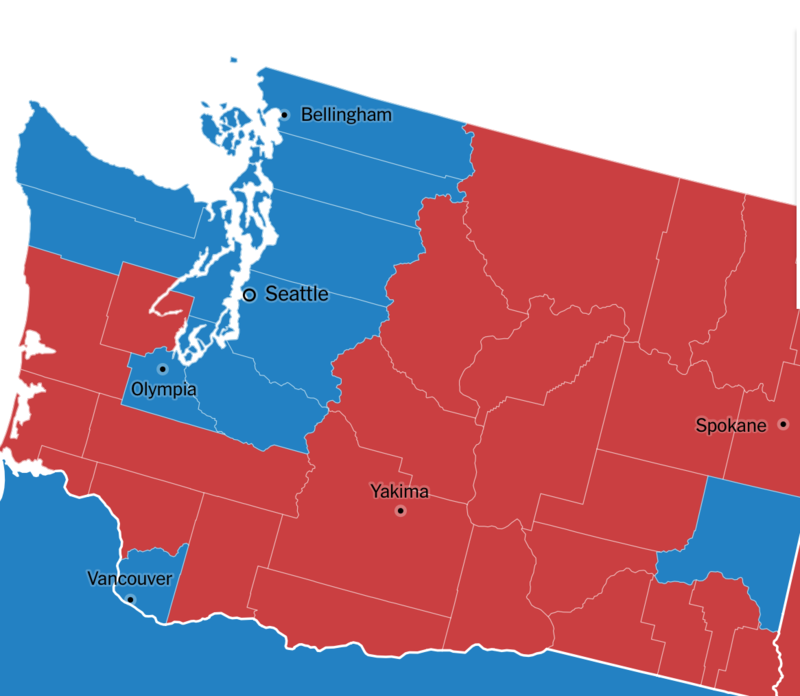 Most rural areas all along the west coast voted Republican. On the map, these appear as red Trumpian rubies, in an otherwise blue jewelry shop. Ohio has always been a deal breaker as the perennial swing state. The results from the recent election show how the state is marked by blue polka dots on an otherwise red dress. These dots are its urban centers of Cleveland, Akron, Columbus and Cincinnati. Although the state went to Trump, the cities went to Clinton. 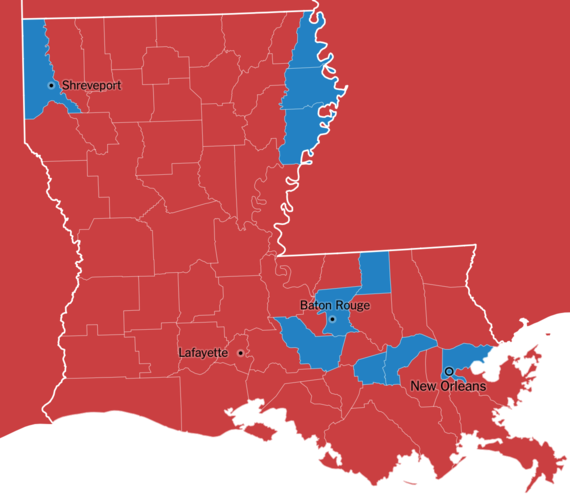 The same occurred in Clinton's original home state of Illinois, where the counties around the Midwestern capital, Chicago, went blue whereas most of the rest of the state went red. Overall the state went to the Democrats because of the high density of people that live in the Chicago metropolitan area and Peoria, these two cities had more people within them that voted for Clinton than practically the rest of the entire state's counties which voted for Trump. 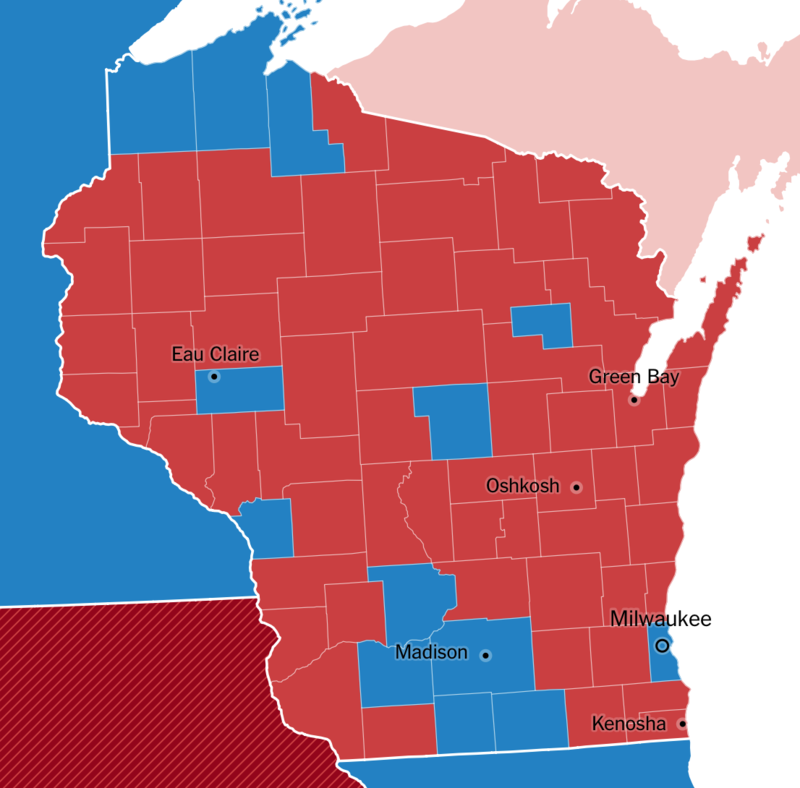 Lastly, in Wisconsin that has historically been a blue stronghold (Clinton hasn't visited the State once since the Democratic convention because it was considered a safe win), surprisingly went to Trump. 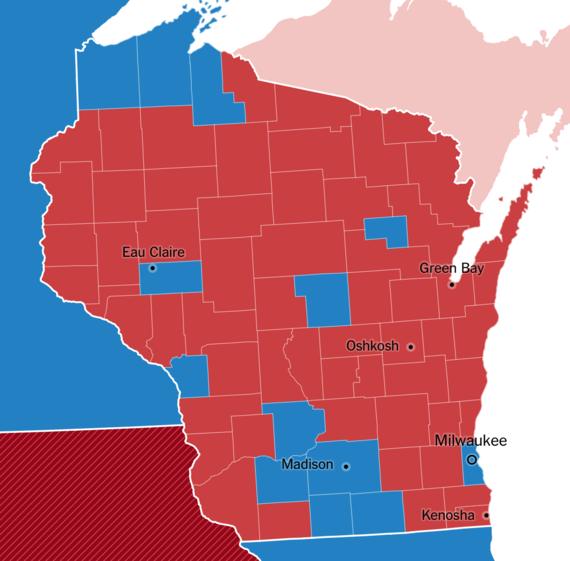 This happened because unlike in Illinois, the urban centers of Madison, Milwaukee and Eau Claire didn't have enough Democrats voting for Clinton to tilt the overall outcome. The rest of the (mostly) rural state, went to Trump. Even in the deeply red republic of Texas, the large economic, political and cultural capitals of Austin, Dallas, Houston and San Antonio voted for Clinton. Republicans control all statewide Texas offices and both houses of the state legislature. Texas has voted Republican in in every presidential election since 1980. 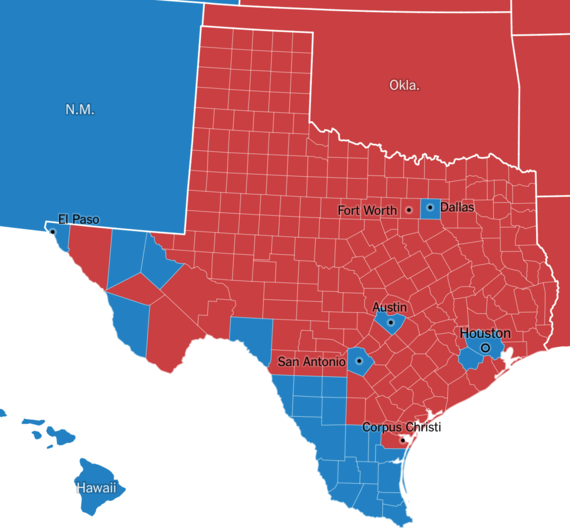 Despite this history, its urban centers are perennially blue, along with a number of counties situated on the border, where Democratic leaning Hispanics make up a larger proportion of the population. In Louisiana too, the large metropolis of New Orleans along with its second largest city, Baton Rouge went blue while the rest of the historically Republican state remained true to its past. Like Texas, the cities were not dominant enough to swing the state for Clinton. The rural vote enabled Trump to win both state. New York has been a Democratic stronghold for years now. It is also Clinton's current home state. Yet, if it weren't for New York City's millions of voters, the state might have gone Trump red. Other than the urban centers of Syracuse, Buffalo, Rochester and Albany, almost all of upstate New York voted for Trump. Virginia displayed the same pattern where the urban zones of Alexandria (right next to D.C.), Richmond and Norfolk, tipped a mostly red state into Clinton territory. The urban-rural, blue-red divide is particularly evident here with Roanoke, which looks like a blue coliseum, surrounded by red soldiers. Part of this is also due to the electoral district gerrymandering, which has taken place in the past. Florida, one of the key states that led Trump to victory within the Electoral College, confirmed the same divide. Cities - Miami, Orlando, Tampa and Tallahassee - voted for Clinton while the rest of the rural landscape was painted red by Trump's rhetoric. Pundits are now asking Trump to unite the country. While semantics are important the real unity in the U.S. requires thinking long and hard about the economic and political forces that deindustrialized and depressed large swaths of rural America. The impoverished, the less advantaged and the marginalized America spoke on Nov. 8th. All Presidential Election maps were created by and courtesy of the New York Times. Written with Nihal Krishan, a political reporter based in Washington D.C.